Decursive is a cleansing mod intended to make affliction removal easy, effective and fun for all the classes having this ability. NOTE: Type /DECURSIVE to open the configuration panel. Decursive's options are not directly available in the "Interface" panel due to ongoing tainting issues Blizzard is not willing to fix. Decursive supports all classes with cleansing abilities and configures itself automatically, it works straight out of the box, no configuration is required. Intuitive interface and detailed options, Decursive is suitable for simple usage and power users. Easily Filter out afflictions you don't want to cure or that are useless to remove by class (some are pre-configured). (Such as afflictions affecting mana on non-mana classes, etc...). If you are a Mage, a Druid or a Shaman you can Polymorph/Cyclone/Hex mind-controlled players. In any case Decursive will allow you to target mind controlled units easily. Decursive supports magic charming affect removal for Shamans (Purge and Hex), Priests (Dispel Magic), Hunters (Tranquilizing Shot), and Warlocks (Fellhunter and Doomguards spells). Your cleansing spell Cooldown is displayed to maximize your dispel speed. An automatic blacklist will prevent you from loosing time on players who can't be dispelled. (player 'out of line of sight' for example). Decursive choose a logical cleansing order depending on your current position in the raid. Visual and/or auditive alerts when someone needs your attention and can be dispelled. Special sound alert when Unstable Affliction is detected and you're about to dispel it. Visual and auditive alert when your dispel attempts are resisted or fail. Decursive is designed to save screen real estate and to be forgotten when not needed. Many options allow you to customize Decursive appearance and interface behavior. All Decursive alert colors can be modified making it suitable for color-blind people. Decursive was developed with memory and CPU usage in mind, installing Decursive won't affect your frame rate even in the worst battle conditions. Bug free: bugs are not tolerated in Decursive. In brief, what you get with Decursive is effectiveness, a player using Decursive will always dispel faster than other players. For other videos about Decursive, see the YouTube playlist. You can subscribe to Decursive's newsletter to be alerted whenever a new stable version is released. For suggestions, feature request, or bug report, use the ticket system provided by WoWAce.com. Development versions of Decursive are available at this URI: http://www.2072productions.com/to/decursive_dev ; note that development versions may be unstable. Unless you want to help testing unstable code you should download the versions considered stable below. Do not forget to rate Decursive! I haven't used this addon since BC but since they readded "remove curse" to mages, I figured i would re-downloaded this addon and try use it again. I'm coming to a problem where the addon does not do anything, it won't change the color of affected targets so I cannot see when anyone has a curse on them at all. Any help would be awesome thanks! Under Curing Options, as a mage, only Charm is selectable. Magic, poison, curse, magic, charm, disease are all uncheckable. This should be fixed in the latest alpha, can you check and confirm it works? You can also remove Decursive to hide the dust under the carpet and keep it there. I was wondering if there's a way to stop decursive from telling me that I'm having so and so LUA errors. having that message pop up in my chat every 3 mins is a little tiresome. Ah, got back the Counterspell without the red asterisk. It MIGHT be a bit clearer to indicate editing is ONLY for a spell that you about to add, not one that already exists. I know it says "this spell" but one might take it for the spell that is already listed by default below. NOW I see if I want to test the layout of the MUFs, I need to go to General, select Show, go to MUF editing and enable Test Layout, then when done, disable test layout, go to General and re-enable In Solo or In Solo or in Group. Got it. Ahhhhh, now I see where to edit it! It seems that it is editable whether I have "Allow internal..." enabled or disabled. Plus the spell name still has a red * after it. Tired to go back to default by "Removing" it so the Custom Spell panel was blank, then re-added it back (into the Add Custom Spell text field via spellbook) and it still comes with the red asterisk. Actually this is not obvious but the "Allow macro editing" option doesn't have a global effect, it only affects the spell you are adding so if you don''t want to enable macro editing, make sure it's not checked when you add your spell. Saw that there was a subsequent beta to what I think you referred to as an alpha (named beta 3-4xxx, so assumed a true alpha) so I installed beta 4 (latest file posted). If General shows MUFs not selected to Show..." but also set for "in solo," the MUF panel shows the Test Layout grayed and unselectable. If I select "Show ..." in general, the single MUF does show, Test Layout in MUF Edit pane is live and selectable. Once selected however, the single box disappears and nothing else shows up (like the 25 boxes that is used to show). Try the latest alpha (2.7.3_beta_4-3), I've clarified the Allow Macro editing stuff and prevented the MUF window from being hidden while the test layout option is on. Additionally showing/hiding the MUFs' window while its auto-hide option is not set to 'Never' will reset it to 'Never' (a message is also displayed). The Test function that is part of the editing MUFs panel. I'll try the alpha later today, thanks again for your help. Custom Spell panel still shows Counterspell with a red asterisk and even though "allow internal macro editing... is NOT selected, it is shown and is editable. UNLESS you had some code in the "alpha" (that is not in the latest beta) you wanted me to test, just say "test alpha & report." Great, I see you changed the tooltip, so I knew what to do. Followed the directions, removed the built in one, entered "/stopcasting" followed by a shift click on the spell from my book. Next Oondasta I should be able to test it because it seems many get MCed in that fight. Actually this is not where you would put /Stopcasting, only the spell link or its name is taken into account. When you check the 'Enable internal macro editing' check-box it allows you to modify the said internal macro through an edit area at the bottom of the spell details (in the lower right pan). Note that /StopCasting is there by default. Found a small bug... I see you made editing MUFs allowable when it was set to not show them... BUT the Test function also doesn't work (waited a good long while for them to show up). I tried setting it to show, the single one showed up, but when I enabled the test pattern, that one disappeared. So sorry to take your time with pesky questions (hoping it may be helpful to others)! So I enabled macro editing in the Custom Spells panel, but not sure HOW to edit the already existing Counterspell internal macro. I DO see that I can use the "Add a custom spell" to get a blue bracketed Counterspell listed. No indication it uses a /stopcasting. So I add a "/stopcasting" in front of the entry and click okay. And it says it's already listed! Indeed, I did manage to "prioritize" Curse first, then Charm, so the feedback in the Custom Spell panel should be correct. Turned off hide muf's and saw it's mouse bindings are set that way, so I should be good to go (tonight is my second ToT progression run and I was told I have to be able to cure the curse happening to team members on the fourth door of Horridon, hence a tad extra anxiety). The regular macro Decursive creates as a "mouseover" macro you can use on any unit or unit portrait (you can bind it to a key). This is more a legacy feature than anything else. I don't think many people use this. The internal macros that are called when you click on a MUF there is one such macro per spell. Odd thing took me a bit to figure out... if you say to not show MUFs unless a condition is met, the preference options also disappear. Seems one has to turn it on, edit any options, then turn it off. hmmm indeed, I shall change that. HOWEVER, in the Custom Spell panel, it indicates left click does Remove Curse, while right click does Counterspell. Correct? The mouseover macro and the MUF macros are different and unrelated (I should clarify that as well in the option panels). The mouse-buttons' assignments depend on your cure priorities. Ah, now I'm getting a much better idea of how Decursive goes about it's business (meaning I can be more effective at using your work). Lightbulb... it casts sells by calling to a "hidden" macro. Assume you mean that CD is shown in the MUF that you clicked on... better visibility for me if I set a TellMeWhen icon for the CD! I see 2 places to allow macro editing, one in Custom Spells, one in Macro Options (mmm, assume you mean editing, not edition)... so I assume either place will allow editing. Yes, I see the macro that it creates... hmmm, it starts with a /stopcasting, so seems little reason for me to mess with it. Am very new to macro creation so I kinda scratch my head about your macro, but it looks like any click (on a MUF) will Remove Curse (being Priority #1), and cntl click will Counterspell, while shift click does Remove Curse (seems redundant no?). 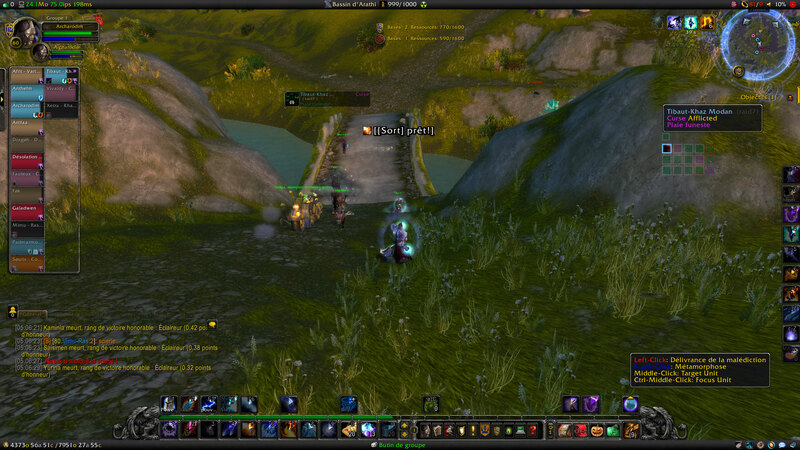 Funny, did an Oondasta fight yesterday and wouldn't you know, many blue flashing MUFs presented themselves. And thanks for putting up with multiple questions! You don't need to have spells in your action bars for Decursive to work. Decursive displays the cool-downs directly on its MUFs when applicable. If you want to use specific commands when casting a spell, you have to use Decursive's custom spell option panel and check the 'allow macro editing' check-box before adding your spell, then you'll be able to edit the macro Decursive will be using internally when casting your spell and thus add a /StopCasting command if you want. Simply read the tool-tips in Decursive's option panels, they should explain everything you need to know on each and every settings. In order for either Counterspell or Remove Curse to work when clicking on a unit in the MUF, does said spell have to be on one of my action bars? AND if said spell is a macro with a stopcasting line in it, will it be honored? Says above the cleansing spell cooldown is shown, does that mean on it's icon in the action bar (i.e. does the spell need to be on them action bar for the CD to be shown?)? Or does Decursive have it's own mechanism? Ah, thanks. Akin to Polymophing a mind controlled friendly. Thanks! Actually, CounterSpell is configured so you can interrupt mind-controlled team members not mobs. It's linked to the 'Charmed' status. Just got Decursive, darista's guide seriously helped! Love that some configs are made based on one's class... good job! One thing strikes me... it was preset with CounterSpell as a custom one (FireMage am I)... and honestly, interrupts I use more than curing curses (i.e. fourth door Horridon)! I can't seem to find any information, how can this be integrated into the MUFs because those are party members, not evil targets. How does this help me to interrupt a mob?